a. Controls and Indicators. Controls allow the gunner to configure the sight to the situation and individual preferences while indicators display the current configuration. (1) The ON-OFF/TUBE BRIGHTNESS control applies power to the sight and controls the brightness of the image intensifier tube. It also enables the ON-OFF RETICLE BRIGHTNESS control to function. (2) The ON-OFF RETICLE BRIGHTNESS control applies power to the reticle and controls the brightness of the reticle. (3) The OBJECTIVE FOCUS RING adjusts the range focus from 25 meters to infinity. (4) The DIOPTER FOCUS RING adjusts the focus of the eyepiece. (5) The DIOPTER INDICATOR indicates the direction of rotation of the DIOPTER FOCUS RING for + and diopters. (6) The RETICLE ELEVATION ADJUSTMENT ACTUATOR controls the reticle adjustment in the up and down direction. Each click of adjustment moves the strike of the round 1.0 inch at 100 meters. (7) The RETICLE AZIMUTH ADJUSTMENT ACTUATOR controls reticle adjustment right or left. 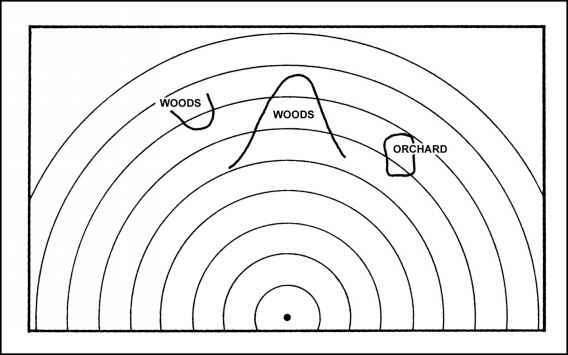 Each click or adjustment moves the strike of the round 1.0 inch at 100 meters. b. AN/TVS-5 Sight Reticle. The MK 19 and the M2 machine guns share the same AN/TVS-5 sight reticle (Figure G-15). Figure G-15. 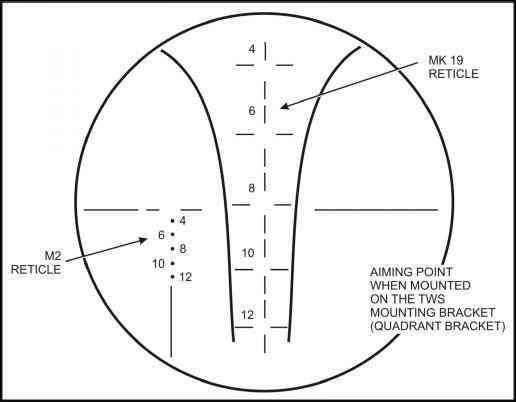 AN/TVS-5 reticle for the MK 19 and M2 machine guns.